Bike Sharing, what is it and how does it work? Milwaukee has been looking at bike sharing for a while. It has even gone so far as to write grant applications for start-up funds and planning. Those applications were not successful, but it certainly shows a real interest. It may prove to be in Milwaukee’s interest to be a bit behind the bike share curve here. We can learn from other cities experiences and get something that works best at the lowest cost. 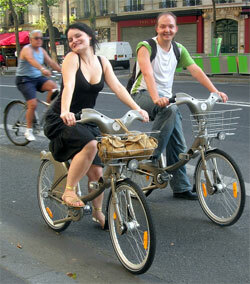 B-cycle has done wonders to transform Paris from an auto-centric city to a bike lover's dream. Personally I have been watching bike sharing systems since the Velo’v program in Lyon and the Vélib’ program in Paris proved to be such huge successes. In order to improve people’s understanding of bike sharing and the various systems out there, I have put together this overview. Since Nice Ride Minnesota has had a full year of operation for a year, I used much of their data as an example of how a bike sharing system is funded and operates. There are variations between systems, and every system must be tweaked for the City in which it operates. But Minneapolis is a pretty good comparison case if you are wondering how a system might work in Milwaukee or your community. What is bike sharing? 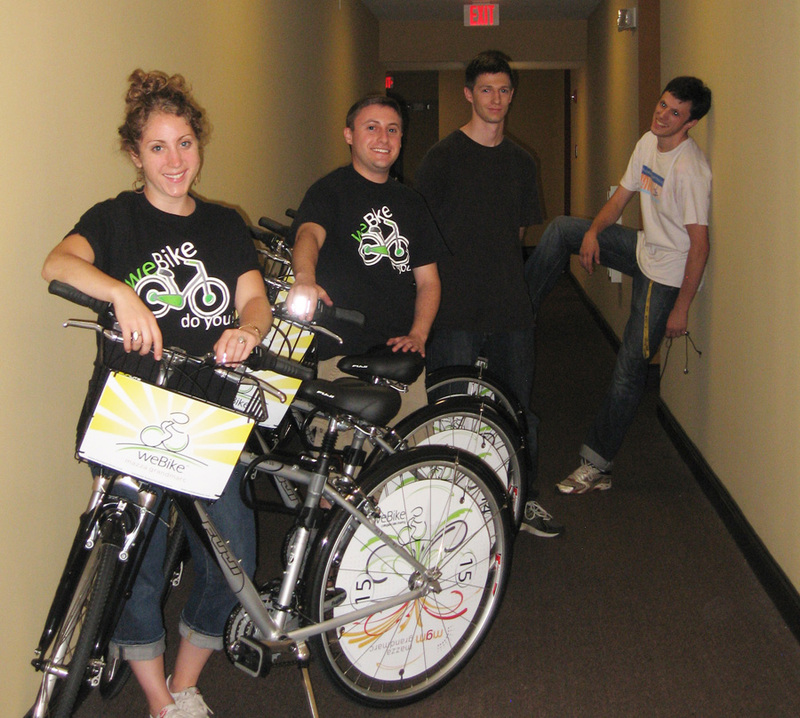 Bike sharing systems provide short-term bike rental through automated systems in cities and on college campuses. Bike sharing is as much pedestrian accelerator as it is a bike program. In the US about 49% of all trips are less than 3 miles, Bike sharing targets these trips. It offers people the opportunity to make trips that are too long to walk, but too short to drive, especially in urban centers where parking is a problem. Users check out a bike with a credit card, membership card, and/or by cell phone at a docking station. There is often no fee for the first 30 minutes for members, but a deposit on the credit card ensures the bike is returned to a parking kiosk. Most systems have a membership fee for frequent users like people who drive to work downtown and need to run errands over lunch, but tourists and one time users can also use the system for a small fee. 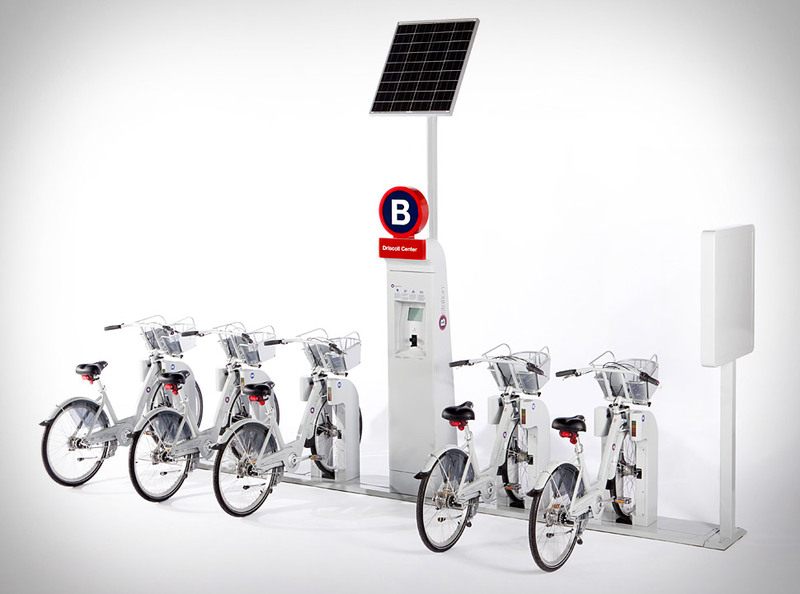 This B-cycle parking kiosk uses solar and wireless technologies to reduce installation costs and allow the system to be modified after user patterns have been established. Bike sharing offers many advantages to users and to the communities in which they are working. About 20 percent of bike share trips replace what would be a car trip. Those trips reduce congestion on our roads, free up parking spaces, and improve air quality. Bike sharing has been proven to get more people riding bicycles. Getting more people active improves the health of a community and will reduce healthcare costs in that community. Bike sharing also works well with transit, allowing people to more easily make the connection from their bus stop to their final destination. What are the different types of bike sharing systems? There are over 240 bicycle sharing systems around the world and the number is growing all the time. With so many programs, there are many different business models, but really only four different operating models. 1st Generation: Systems with donated used bicycles that are all painted the same color and spread around a city for anyone to use. Madison had a red bike program for a while. Portland had yellow bikes and Amsterdam had white bikes. These programs which began in the late 60s and lasted into the early 90s proved to be ineffective because without a deposit, the bikes were quickly stolen or lost. 2nd Generation: These low tech systems typically use cash or coins to unlock the bicycles from the parking kiosk, kind of like the carts at the airport. The coin deposit and funky design of the bikes are meant to deter theft. I was able to use Copenhagen’s 2nd generation bike share system,City Bikes, when I was there. The bikes were pretty crummy and the stations were spread a bit too far apart. Most cities with these systems are now replacing them with 3rd generation bike share systems. 3rd Generation: This is the modern system that uses high-tech kiosks, solar power, wireless technology, Smart Cards and cell phone technology. The Velo’v program in Lyon and the Vélib’ program in Paris really proved the effectiveness of these systems. There are now more than a dozen such systems in operation or planned in the US. The most publicized systems are in major metro areas or college towns like Chicago, Washington, D.C., Minneapolis, Madison, Denver, and Boulder. But there are also systems in Des Moines, Nashville, Louisville and San Antonio. The weBike start-up team. Could weBike be the transportation equivelant to Facebook? Case Study: Nice Ride Minnesota has been in operation for over a year. Located in the snowy and cold midwest market about the same size as the Milwaukee metro area, it serves as a good case study. The program in Minneapolis has been universally viewed as a success. As such, there is a lot of interest in expanding the program to a wider area including St. Paul. Below I review the start-up program that they call Phase 1. Nice Ride uses a Bixi bicycle system. Bixi is a Montreal-based company. Managed by: Nice Ride Minnesota, a registered 501c3 non-profit organization. Business Plan: Nice Ride Minnesota’s business plan is to pay for operations and accumulate reserves for future equipment replacements using revenue from subscription sales and fees and station sponsorship. Based on year 1 experience the model appears to be sound. $250,000 from the City of Minneapolis Convention Center Fund. Fees: The cost to use the Nice Ride system is a combination of subscription price, plus trip fees. Subscriptions and fees are subject to 7.775% sales tax. A trip starts when you take a bike and ends when you return it to any station. To avoid trip fees, simply return your bike to a station within 30 minutes, and check out another one. Take as many trips as you want during your subscription. * 24 hr subscriptions require a $50 deposit, for more information see the Subscriptions page. Winter Season: Closed from December through March. Bike share equipment is expensive, and road salt is very damaging. The equipment is removed from the street during the winter months when road salt is present in order to protect the capital investment and comply with the terms of equipment warranties. In addition, the location permits issued by the City stipulate that the equipment cannot be on sidewalks and streets during the winter so as not to impede snow removal. The Twin Cities has as large a group of winter cyclists as any cold weather city, but they make up a very small fraction of the number of people who ride in the summer months and it is unlikely there would be see enough usage to cover operating costs, and certainly not the capital replacement cost of equipment. Rebalancing: During the first season, rebalancing work was done with 1 full size pickup truck and trailer and 2 smaller electric vehicles. The rebalancing vehicles were on the street every day of the week from 6am to 1am. Generally this worked well but there were times when stations become completely full or empty. Special events can present a challenge for rebalancing system. Total trips: 100,817 (20% of these replace a car trip according to the survey below). No reports of serious injury. 1 report of an accident involving a car, the front wheel was damaged, but the rider was not injured. 66% said the amount of biking they did increased after subscribing to Nice Ride. 89% reported their primary use of Nice Ride is for transportation, not recreational riding. Funding: Nice Ride Minnesota is currently seeking funding from a combination of public and private sources for the Phase 2 expansion. Blue Cross and Blue Shield of Minnesota spurred the fund-raising efforts by pledging up to $1.5 million towards Phase 2 (contingent on obtaining public funding proportionate to the successful Phase 1 public/private partnership). This entry was posted in Advocacy and tagged b-cycle, bike sharing, bike-share, bikeshare, bixi, sobi, webike. Bookmark the permalink. 14 Responses to Bike Sharing, what is it and how does it work? I used 24-hour subscriptions on two separate visits to Minneapolis and was very happy with the bikes, the ease of use and the locations of the stations. It made it very simple to move around the downtown core as a visitor. I’m sure for residents who get a chance to learn the pattern of where the stations are in relation to their destinations it would be even more handy. The NiceRide bikes weren’t suited to carry much, that would be my only suggestion for improvement, but overall it was a great experience. I can really see it working in Milwaukee – Marquette student wants to head over to the lakefront? Downtown worker needs to go a couple of miles for a meeting? Conventioneer wants to check out a few spots in the evening before dinner then cab it back to the hotel? check, check, check Can we pull this off? It would be awesome! d’Andre, the B-cycle bicycles have an actual basket on the front instead of just the rack/kiosk mount that the Nice Ride Bixi bikes have. Do you think that would provide enough carrying capacity? I guess you can compare the two later this year when Madison gets their program rolling. How awesome to be able to try two different bikesharing systems so nearby. Only a couple years ago you had to leave the country to try a real bikeshare system! I bet Milwaukee would already have a system too if we were offered the sweet heart deal that Minneapolis or Madison got. 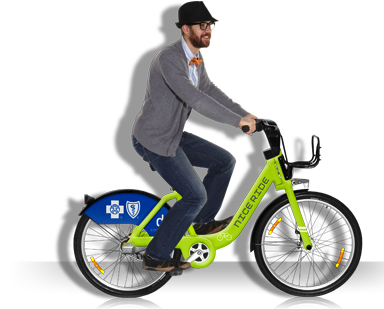 Minneapolis used $1.75 million from their $25 million non-motorized transportation pilot project and then got funding from Blue Cross too. Madison of course is going to get $3 million from Trek. Can someone introduce me to Milwaukee’s bicycle sugar daddy? Maybe when we are in DC at the National Bike Summit we can get the whole WI delegation to go on a bikeshare test ride together! We have a “Yellow Bike” program here in Menominee MI. It has come a long way since its start 4 years back! But as the article points out this is largely, no, totally a private venture. It is great to see large municipalities going in this direction too! I wish Milwaukee and Madison luck getting their programs going. The City owns the bikes, and it is great to see Menominee do this. But if it wasn’t for local citizens and a civic organization taking the ball, this never would have happened here. Without interest from the public this program would not have gotten off the ground here. I do not, or should I say, am not always able to bring a bike down with me when I visit. If I find myself in Milwaukee and need a bike, this would be a nice way to get one to use. Ralph, thanks for the link to that story. A great example of a group of citizens making their community a better place to live and a more attractive place to visit. Are the bikes owned by the City to limit liability exposure for the donors and volunteers? It sounded like the bikes were all either donated or purchased with donated money from the Rotary. Dave, I am not entirely sure how it all shakes out as I am only peripherally involved….. While I would love to see this in Milwaukee, I guess I’m ok with letting Madison and Minneapolis lead the way this time. In the current political environment it seems that there is outrage whenever any tax dollars are being spent on bike infrastructure. I’d like to see us focus the tax dollars we do get on additional bike trails, lanes, and other facilities that will grow our ridership. Increased ridership will create more demand and support for launching a bike share program. Additionally, if this works well in the first year or two in Madison, it will be that much easier to gain support to bring it to Milwaukee. On the flip side, if it does flop, we’ll be happy we weren’t “early” adopters. Thanks for the comment Casey. I’m glad you would like a bikeshare program in Milwaukee. I do have to disagree with you on some levels. First, with about 240 bikeshare programs world-wide and more than a dozen in the US, virtually all of them wildly successful, there is little reason to think a similar program in Milwaukee would flop. Two years ago there was, but not any more. Second, many of these bikeshare programs involve little or no tax dollars. They are funded privately. Finally, while I agree we get push-back about any taxes being spent on bike stuff, I think it is time to turn that conversation around. Today WisDOT announced a $490 million dollar project to dig tunnels for freeway off ramps would close a major interchange for a year. This is part of a $1.9 BILLION freeway expansion that will leave a legacy of maintenance more than double the current levels. If anyone really cares about reducing spending, let’s point the finger in that direction. I think my view is unfortunately getting warped with my inability to ignore the article comments on jsonline. While I hope that many of these commentors are the loud minority, trying to talk reasonably with them is impossible. Providing facts like successful programs elsewhere, or the huge expenses of road projects will get you now where, as they find facts easy to ignore. So while I agree that a program like this could be successful, and I’d love to see us shift funding from car transportation to pedestrian, bike, and mass transit, I’m just not sure where you start when trying to convince the masses. Casey I think you have pointed out a very real problem. At times I too have succumbed to the belief that the comment trolls represent the majority beliefs of my fellow citizens. But I believe those comments represent a self selected minority of people who consistently ignore or bend the truth to fit their spiteful agenda. Because their voices have been amplified through comment sections in online versions of newpapers, Fox Television and talk radio, they have been gained enough credence that the entire public dialogue has shifted. We cannot allow anger, avarice and selfishness set our agenda. How to do that is more difficult these days. It might be more than I can fit in the comment section here and worth a post all on its own. Hey there – thanks for the shoutout! We just caught this article while doing some digging on industry trends, of which you have a great description here. Nice work. Awesome, I would be happy to shoot some details over to you! In the meantime, here’s one of my favorite articles .. it can offer a bit more insight on our program.